Learning how to make concrete countertops can save you a lot of money and be very rewarding if you're doing it for yourself. Adding your own personality and flare to the project will be something you can be proud of for many years. There are two basic ways to make a concrete countertop. Each has its own advantages and disadvantages. I'll cover both ways with links to other helpful information along the way. Making concrete countertops depends on your skill level and the complexity of your countertop. Here you can learn the vital basics with the information listed below. When deciding how to make concrete countertops, the first thing you will have to decide is will you build a precast concrete countertop or a poured in place concrete countertop? Building the countertop in a shop gives you more control of the environment and allows you to pour the countertop upside down for a nice smooth, flat finish depending on your forming material. Pouring the concrete countertop in place allows for a seamless finish as well as adapting to some design challenges like curved or angled walls. 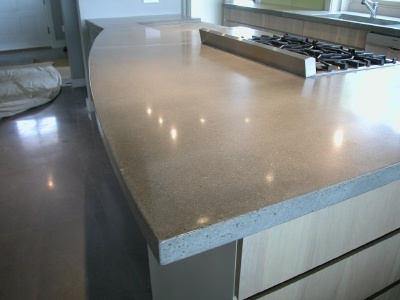 Designing your concrete countertop by choosing its shape, thickness, color, and finish, are part of the appeal to making a concrete counter by yourself. Choosing the type of sink, adding crushed glass to the mix, or polishing the surface to a mirror finish, are what makes a concrete countertop very different from granite or laminate. Forming a concrete countertop with melamine, a type of wafer board with a smooth white surface, is the easiest and most economical way to build the mold. This material cuts easily, can be screwed together tightly, and leaves you a nice smooth finish if all the air is vibrated out of the concrete. Choosing a concrete countertop mix from the many pre-mixed bags can be difficult. Most pre-mixed bag mixes will work for you, just follow the instructions carefully and don't get the mix too soupy. Pouring the mix too wet will weaken it and increase you chances for cracking. Adding reinforcement to the mix will add tensile strength and help avoid cracking. Using steel rods, wire mesh, fibermesh, or glass fibers are the most common types of concrete countertop reinforcement. Pouring the concrete countertop into the form is usually done in two layers. The first layer completely covers the bottom of the form and is pressed carefully into place, making sure there are no voids or air pockets. If you're adding wire mesh, this is done now, then the second layer is poured to fill in the rest of the form. Finishing the concrete countertop is either done by hand troweling or polishing with a hand held grinder & diamond pads. Both methods do require some skill for a nice smooth finish. I would recommend starting on something small to get the feel of how each one is done. Curing the concrete countertop is very important to minimize shrinkage cracking. The slower it cures, or dries, the stronger it will be and the less likely it will be to crack. Applying concrete countertop sealer is one of the most important steps. There are many different sealers on the market, each one has its advantages and none of them are perfect. If this is your first time applying sealers, go with something simple and protect the sealer with a food grade bees wax.